Since I never watched one of these “ebooks alternatives” I was really curious to discovers how they work, so I’ll spend also a couple of minutes to review the video course platform as well. All the courses are available in your Packt’s account private section, as per ebooks, in My Videos area. You can choose to watch the full course online or to download the whole package ( around 500Mb) for offline watching, in both case all the sample code used in the book are fully downloadable as a separate packages. If you go for offline mode your download content will be a alternative copy of the online site plus a small getting started pdf to guide you through the first time browsing. The main page is a carousel browsing where you can select the different section and watch its video. If you go for the online solution, you will be redirected to the main course page where a single page interface (much simpler then the offline mode, IMHO) will guide you during the navigation. All videos have a small text introduction describing chapter topics and purposes plus a couple of button to provide feedbacks (by email), ask for support (you will be redirected to PP standard site support page), or go back to your account download section. All is quite well organized, chapters are split in less-then-5-minutes videos easy to understand (I’m not an English mothertongue) and with a good image quality (from 300p up to 720p) which grant text readability. 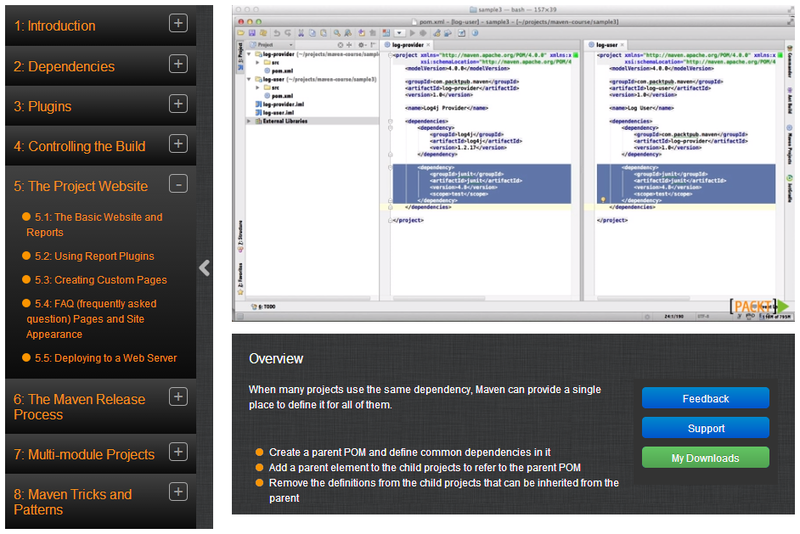 Ok, this is enough for the Video review, now let’s start with the real Getting Started with Apache Maven review. The Course is organized in 8 main chapters, covering all Maven main topics. You start with a classic Introduction chapter where you get a small historical overview and then go straight to tool installation and setup and start with fundamentals like Maven repositories , lifecycle and plugins. In Dependencies chapter we go in details of how maven’s dependency collection works, introducing the concept of transitive dependencies, hierarchical structure (this chapter will sound quite familiar to AroundTheCode readers ; ) ) parent poms and dependency managements. The Plugins chapter start dealing with plugin configuration, seeing how to configure them, bind maven’s default parameters to our wills and manage them all through parent poms. This chapter closes with a really useful video providing hints on how (and where) search for the thousands of plugins available on the web to look for the one you may need. Controlling the build introduces usages of properties, profiles with their different activation approach and settings.xml customization. The last section of this chapter is fully available on youtube for as a sneek peek of the full course. Maven Release Process deals with the process of releasing a project to a public repository, promoting snapshot version to stable ones via maven-release-plugin and illustrating all prerequisites to deploy an open-source project to maven central. Closing chapter is dedicated to Maven Tricks and Patterns. Here you will deal with maven-ant cooperation, create end-user installers for your artifacts, run advanced integration test and generate proper reporting from them or manage some advanced configurations topics like dependency exclusions or plugin bindings. Ok, the overview is completed, not it’s time for a recap. My feedback on course and product is overall positive. The big pro of watching the video course rather than reading an (e)book is how it drives you more hands-on to the problem. The author explains concept in a very clear and concise way, taking advantage of jumping from the IDE for editing poms, to CLI to execute goals up to some slides to better illustrates concepts and browser to navigate all major maven-releated site to retrieve information and samples: basically the day-by-day work of people dealing with Configuration Management tasks. But in all these jumps, the author stays focused on the main topic, driving the watcher straight to the core of the process, with no useless detours, keeping all videos length to the minimum needed to fully hit the target. What I’m saying is: this is a really good video course to start using maven or to strengthen your knowledge on it. Watch it, it’s really useful, but take the right time to do so!